The cast gathers around as director Brian O'Sullivan shows a photo from the actual Moscow theatre seige of 2002, on which my show is based. Rehearsals for the world premiere of “57 Hours in the House of Culture,” my full-length script about the Moscow theatre siege, began Sunday evening, April 22. The show runs May 16-27 at Studio Roanoke. 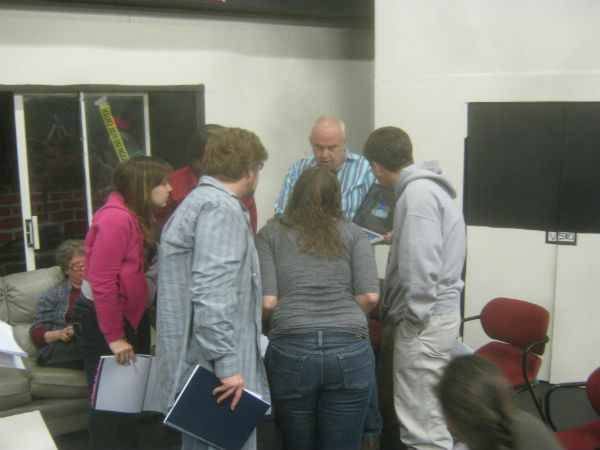 The cast gathered with director Brian O’Sullivan and stage manager Brandon DuMonde for the first read-through. For some of the cast members, this was doing double duty — most of them had already been in a show earlier that day. Owen Merritt, Kelly Anglim and Gary Reid had just finished “Monkey Wrench” at Studio Roanoke. Tim Kennard and Joel Gruver had likewise had their final performance of “Lion in Winter” at Showtimers. We’ve had one last-minute cast change. Peter Colbert had to drop out due to some unforeseen scheduling conflicts, but Joel Gruver has signed on to play Ivan the usher. I’ve been a fan of Joel’s work for some time and am delighted to be able to say he’s in my show. In fact, I saw him just Friday night in action as the French king at Showtimers. We’ve also added on Blake Lipscomb for a small role as a Russian soldier; we’re still scouting for another Russian soldier. * Russian soldier: Blake Lipscomb. Gary and Diane, it should be noted, are the main characters — two audience members caught up in a horrific event beyond their control. They also showed up with almost all their lines already memorized — this even though Gary was just in a show! 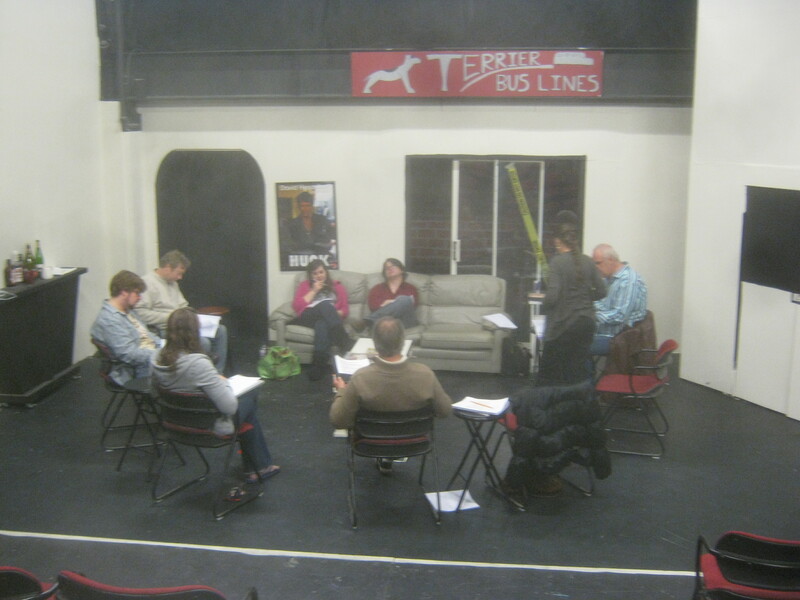 The cast gathered on the set of "Monkey Wrench" for the first read-through. This entry was posted on April 23, 2012, 11:16 pm and is filed under News, Productions, Uncategorized. You can follow any responses to this entry through RSS 2.0. You can leave a response, or trackback from your own site.